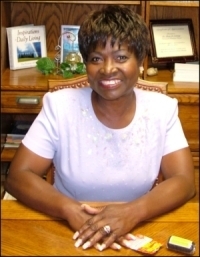 Dr. Betty Swinney holds a Doctor of Divinity Degree with Omega Bible Institute and Seminary, an Associate Diploma in Biblical Counseling from Grace Bible College, an International Multi-Denominational Certificate of Studies in Biblical Counseling from Grace Bible College and a Certificate of Enrichment in the New Testament and Victoriously Walking in Christ from the Marilyn Hickey Bible College. She received her Ordination Certification from The Living Word, Inc.
Dr. Betty J. Swinney, co-founder and Assistant Pastor of Outreach Christian Center in Clinton, Maryland has been a compelling strength in the ministry of the gospel of Jesus Christ since 1982. Dr. Betty’s many roles include Teacher of Divine Healing, Sunday School Superintendent, Worship and Praise Leader and Retreat and Conference Speaker. She is also founder of the Esther Generation Network Woman-to-Woman Ministries, and Chief Executive Operator and Principal of Outreach Christian Center Academy. Dr Betty is truly gifted and anointed to teach the living Word of God and has a powerful and unique teaching technique. She uses various visuals effects, role playing and skits, making the Word of God easily understood from the youngest to the oldest listener. She has authored several books and papers on the authority of the believer such as, “Renewing the Mind: The Key to Transformation”, “Anointed to Conquer” and “Receiving Your Inner Healing” just to name a few. She has an overwhelming desire to share “inside information” so that God’s people can learn to triumph over the wiles of the enemy. Dr. Betty has true compassion for anyone suffering from any type of illness. Having been healed herself by the power of God from incurable asthma, Dr. Betty operates in the spiritual gift of divine healing and the Lord has used her to manifest His healing power to several believers that were suffering from cancer, tumors, diabetes, high blood pressure, asthma, barren wombs, mental illness, shattered families and drug addiction.